This publication addresses some of the changes, the impact and planning considerations of the tax reform bill that all taxpayers will be filing under when they complete their 2018 tax returns in the coming months. Most of the provisions are effective in 2018, with a number set to expire in 2025. When making decisions based on these provisions, it is important to work with your Wells Fargo Relationship Manager, accountant and attorney to make well-informed and thoughtful decisions. The long awaited tax reform bill was signed into law in December of 2017. The goal of this publication is to briefly highlight a few important aspects of this bill related to all taxpayers and to review the impact it will have on individual investors and business owners. This paper will also discuss some of the planning issues to consider given these changes. The impact of these changes will vary depending on each individual’s particular situation. Also, many provisions of this bill are ambiguous and will require clarification. We expect to receive additional guidance in the form of Treasury Regulations throughout 2019. The provisions listed here went into effect in 2018 unless stated otherwise. The items in bold are scheduled to expire on December 31, 2025. Therefore, any planning considerations should be evaluated with that in mind. The remaining provisions are not scheduled to expire unless otherwise noted. For individuals, the new law provides for the same number of tax brackets, but with lower rates and different income thresholds. See the charts below for income thresholds associated with each bracket. The tax rates for trusts and estates have also decreased and now consist of only four brackets. Rates for qualified dividends and long-term capital gains are unchanged. The income thresholds for the capital gain brackets are no longer tied to the ordinary income brackets. 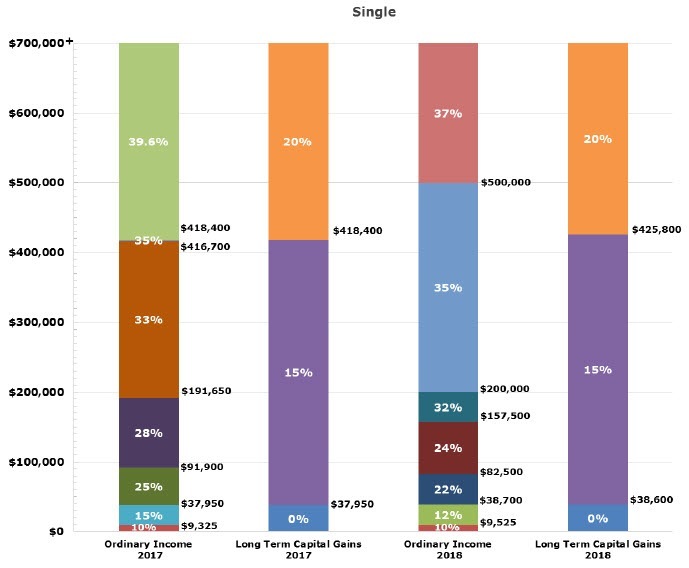 See the following charts for a comparison of the capital gain and ordinary income brackets. 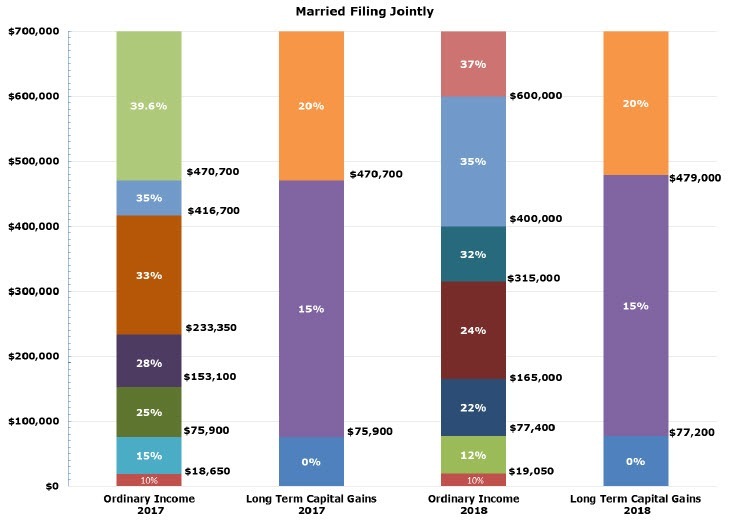 Note that the top rate of 37% begins at $500,000 for single filers and at $600,000 for married filing jointly. Congress did not repeal existing Medicare taxes (the 0.9% additional payroll tax, or the 3.8% tax on net investment income) that apply to higher-income taxpayers. These apply when adjusted gross income (AGI) exceeds $250,000 (joint) or $200,000 (single). Because taxable income is determined after applying deductions, it will be important for each taxpayer to evaluate how the loss of certain deductions may offset the benefit derived from the lower rates. The standard deduction is nearly doubled to $24,000 for married filers and $12,000 for single filers. The additional standard deduction for individuals who are age 65 or older, or blind, is retained. Personal and dependent exemptions (currently $4,050 per person) are eliminated. The deduction for state and local taxes is significantly changed. This deduction will be capped at $10,000 for the sum of state and local property taxes and income taxes (or sales tax in lieu of income tax). Property taxes paid in carrying on a trade or business will not be subject to this $10,000 cap. Mortgage interest deduction limit on qualified acquisition debt is reduced from $1,000,000 to $750,000. This means interest is deductible on loan balances up to $750,000 used to buy, build, or improve a primary home or one second home. This reduction applies only to debt incurred on or after December 15, 2017. Interest on home equity loans, other than a limited amount that was used to acquire or improve a qualified residence, is no longer deductible. Cash contributions to charitable organizations may now offset up to 60% of Adjusted Gross Income (AGI) (up from 50%). Deductions for investment expenses (excluding certain investment interest expense), tax preparation fees, and unreimbursed employee expenses are eliminated. Medical expenses exceeding 7.5% of AGI are deductible (down from 10%). This reduced limit applies only for 2017 and 2018. Casualty losses are limited to those attributable to a federally-declared disaster area. The phase-out of itemized deductions for higher-income taxpayers is eliminated. The child credit increases from $1,000 to $2,000. The income level at which the credit begins to phase out also increases allowing more taxpayers to benefit. Alimony payments are no longer deductible by the payer and not taxable to the recipient. This provision is effective for a divorce or separation instrument executed after December 31, 2018 or for changes to an existing instrument after that date, if the changes expressly provide that the new law should apply. The Alternative Minimum Tax exemption and phase-out levels are increased, potentially allowing many more taxpayers to avoid AMT. How these changes affect each taxpayer is dependent on his or her particular situation. For those who don’t itemize currently, a larger standard deduction will be a welcome benefit. The repeal of many itemized deductions could mean that some taxpayers, who previously itemized, could find themselves limited to a standard deduction that is smaller than the amount they used to deduct under itemization. The $10,000 limit on state and local taxes (including property taxes) will be especially impactful to those in high tax states. Although taxpayers may still itemize, the impact of the limited deduction may offset savings from the changes to the tax brackets. The repeal of personal exemptions may be mitigated or offset by the increased standard deduction and/or child credit. For taxpayers who are charitably inclined and over age 70 1/2, it will be important to evaluate whether it is more beneficial to make a contribution of cash, stock, or a qualified distribution from an IRA. The best strategy will not be the same for everyone. Some taxpayers may want to consider “bunching” charitable contributions into alternate years, with a view to qualifying for itemization at least some of the time. Bunched gifts to donor-advised funds might be another way to accomplish this goal. However, the cash flow impact on the taxpayer and the charity should be considered. The rule allowing a contribution to one type of IRA to be recharacterized as if made to another type of IRA is modified to exclude Roth IRA conversions. Normal IRA contributions may still be recharacterized. Taxpayers who want to convert their Traditional IRA to a Roth IRA will need to carefully consider the consequences as they will no longer have the ability to change their mind. A Roth conversion can still be a useful tax strategy in years with low taxable income or a market decline in retirement plan assets. Qualified distributions from a 529 plan now include up to $10,000 annually for elementary and secondary tuition including private and religious schools. ABLE accounts may accept tax-free rollovers from 529 plans, up to the annual contribution limit for ABLE accounts. Both 529 college savings plans and ABLE accounts (designed for disabled beneficiaries) become more attractive tools for meeting savings goals. Consider additional funding for a 529 plan since the funds may now be used for tuition for grades K-12. Investment income of a child will be taxed at trust income tax rates rather than individual income tax rates. For children under age 24 who are full-time students, investment income is no longer taxed at their parent’s rate but at trust rates. The top trust income tax rate is the same as the top rate for an individual. However, the top trust rate applies at a much lower level of income likely resulting in a higher tax bill under this new rule. Review gifting strategies for younger family members along with the various vehicles available for holding funds in a child’s name. For minors, a trust and a custodial account may now have similar tax implications, but still differ substantially regarding distribution requirements and asset control. If gifts are intended for education, the tax rules for 529 plans are more favorable. For other gifts, investment choices will be important to consider in order to control the amount and character of income generated while the child is subject to these rules. The new law doubles the “applicable exclusion” to $11,180,000 per person, effective in 2018. This exclusion will continue to be inflation-adjusted in future years. The “portability” election, which permits a deceased spouse to transfer unused exclusion amounts to a surviving spouse, is unchanged. The rules providing a “step-up” in cost basis at death for capital assets are unchanged. A married couple, with basic planning, should be able to transfer up to $22,360,000 with no federal estate tax. Existing estate plans for married couples often call for automatic, maximum funding of a “credit shelter” trust at the first spouse’s death. This could result in less-than-optimal use of the deceased spouse’s exclusion, and sacrifice the opportunity for a “step-up” in cost basis at the surviving spouse’s death. Estate plans created before 2013 should definitely be reviewed, and even recently created plans may need to be reconsidered in light of dramatically increased exclusions. Existing documents may include “formula clauses’ that may now result in all or more assets being used to fund credit shelter trusts, and little or no assets left to the surviving spouse. Instead of doing less estate planning, these higher thresholds could be viewed as an opportunity to do more. In particular, higher generation-skipping exclusions provide an opportunity for multi-generational wealth preservation planning. Furthermore, estate planning is not solely about estate taxes. There are many reasons to examine wealth transfer options that relate to family dynamics and overall asset protection. As noted earlier, this is not a permanent cut. Failing to plan may result in lost opportunities if the exemption reverts back to current amounts in 2025. Individuals with charitable planning goals may benefit from adjustments to strategies and timing. For example, if no estate tax is owed, a charitable bequest does not result in any tax reduction. Perhaps lifetime giving strategies — which could provide an income tax deduction for itemizing taxpayers— should be evaluated as an option. In addition, it will be important to consider naming a charity to receive funds from IRAs, qualified retirement plans, or deferred annuities, as distributions from these assets would otherwise be subject to income tax if distributed to individuals. The tax rate for C Corporations is reduced from 35% to a flat rate of 21%. There is a new deduction of 20% for qualified business income of S corporations, partnerships, and sole proprietorships. Generally speaking, this special deduction is allowed against business profits, and does not apply to wages earned by the business owner. The amount of the deduction generally cannot exceed 50% of wages paid by the business: however, capital-intensive businesses may qualify for an alternative limitation based on the acquisition value of capital assets. This deduction is not available for businesses that provide services in the fields of health, law, accounting, actuarial science, performing arts, consulting, athletics, investment or brokerage services, or any business where the principal asset is the reputation or skill of one or more of its employees. However, owners with taxable income below $315,000 (if married filing jointly) or $157,500 (if single) are still permitted to take this deduction, without regard to the limit for wages or specified services businesses. Taxpayers are also able to deduct 20% of income received as qualified REIT dividends, qualified cooperative dividends, and qualified publicly traded partnership income. 100% expensing of qualified business property is allowed for 5 years after which it gradually phases-out. Increased limits for expensing are allowed under Section 179 and certain real property improvements are added as qualifying property. Current business entity selection may need to be reconsidered in light of these changes. Significant tax benefits are now available to businesses which have been waiting to invest in capital expenditures. Many questions remain about the details of how the deduction for pass-through entities will apply. Business owners should work closely with their CPA to determine whether they qualify for the deduction. Proposed Regulation from the Treasury Department were published in August of 2018 and provides additional guidance for the 20% business deduction including defining terms used in the statute and how the deduction is calculated for taxpayers with multiple businesses and losses. Guidance for expensing qualified business property under Section 168 commonly known as Bonus Depreciation can also be found in Proposed Regulations from the Treasury Department. The type of business activity conducted will have a significant impact on whether and how a taxpayer benefits from the new pass-through deduction. Business owners will want to evaluate whether it is beneficial (and practical) to segregate “favored” and “unfavored” business activities into different entities. When considering a change of business structure or entity type, it is important to evaluate how the expiration of these new rules will impact the value of any particular strategy. As always, it is important that a tax advisor and attorney are involved to carefully weigh any decisions related to choice of business entity. Some state tax provisions are tied to federal tax provisions. Upon enactment of this federal law, each state will have to decide whether it will adhere to the federal changes. Differences in state and federal laws lead to additional complexity, record keeping, and tax preparation costs. Some states use federal taxable income as the starting point of their tax calculation. If a taxpayer’s federal taxable income increases due to the loss of certain federal deductions, his or her state tax bill could increase even without any specific change to state law. Any tax strategies considered for federal tax planning purposes should also take into account the state tax impact. It is important to consider the impact of the new law when determining estimated tax payments for 2018. The thresholds for state estate taxes are often considerably lower than the federal applicable exclusions. A few states have “tied” their exemptions to the federal exclusion. It’s not sufficient just to plan for the laws of the state where an affluent taxpayer lives. To preserve family wealth effectively, it’s increasingly important to consider the potential impact of state taxes in the places where heirs and beneficiaries live as well. The individual provisions listed each represent a significant change to current law. In combination, the overall effects will vary widely among taxpayers. As time passes, we will have more clarity on the details as well as planning strategies to share. Now is the time to gather your advisor team. Your Wells Fargo relationship manager and/or your Wells Fargo Advisors financial advisor along with your estate attorney and tax advisor will be instrumental in determining what action steps may be appropriate for you in the short and long-term. All data sourced from the IRS unless otherwise noted. Please consider the investment objectives, risks, charges and expenses carefully before investing in a 529 savings plan. The official statement, which contains this and other information, can be obtained by calling your financial professional or the plan sponsor. Read it carefully before you invest. The availability of tax or other benefits from a 529 plan may be conditioned on meeting certain requirements. Wells Fargo Wealth Management and, Wells Fargo Private Bank provide products and services through Wells Fargo Bank, N.A. and its various affiliates and subsidiaries. Wells Fargo Bank, N.A. is a bank affiliate of Wells Fargo & Company. Wells Fargo & Company and its affiliates do not provide legal or tax advice. Please consult your tax and legal advisors to determine how this information may apply to your own situation. Whether any planned tax result is realized by you depends on the specific facts of your own situation at the time your taxes are prepared.